A class at South Slope CrossFit in downtown Asheville can accommodate participants with varying levels of fitness. Dan Hartley and Scott Mirkin are co-owners of South Slope CrossFit on Coxe Avenue in Asheville. Workout equipment at South Slope Cross Fits is basic and designed to help participants gain strength and endurance. After working together as fitness coaches at a local gym, Dan Hartley and Scott Mirkin decided to pool their resources and open South Slope CrossFit in downtown Asheville a year and a half ago. Both Hartley and Mirkin have a long time dedication to physical fitness and were drawn to CrossFit because of the benefits it offers as a comprehensive workout with flexibility. At South Slope CrossFit, members range in age from teenagers to retirees and have varying levels of workout experience and fitness. The average class size ranges from 12 to 14 participants who are assisted by coaches. “We’re always there to guide you,” says Mirkin. The workouts planned each day are varied and encompass “a little bit of everything,” Hartley says. The class sessions incorporate basic elements of a workout, beginning with a warm-up and moving onto various levels of strength and endurance training using free weights, resistance bands and other equipment. The emphasis on strengthening the core of the body is “absolute,” Mirkin notes. Aerobic exercise is another key component of CrossFit sessions, with rowers and bikes available to use. The classes conclude with stretching techniques to keep muscles supple. Unlike some more standardized fitness classes, at CrossFit, people can work at different levels in a given session as they use a variety of exercise equipment including barbells, dumbbells, gymnastics rings, ropes, kettle balls, plyo boxes, resistance bands, rowing machines and bikes. Workout programs can be modified to fit individual needs, says Hartley. “One of the absolute things is how inclusive it can be,” he remarks. An important focus of CrossFit classes is on the community experience, Mirkin says. Class members connect with each other, sometimes in an atmosphere of friendly competition. Accountability is another goal of CrossFit coaches, says Hartley. “We like to have clear measures. Everything we do is measurable and repeatable,” he says. At the end of each class, participants record the results of their individual workouts and can monitor their progress. 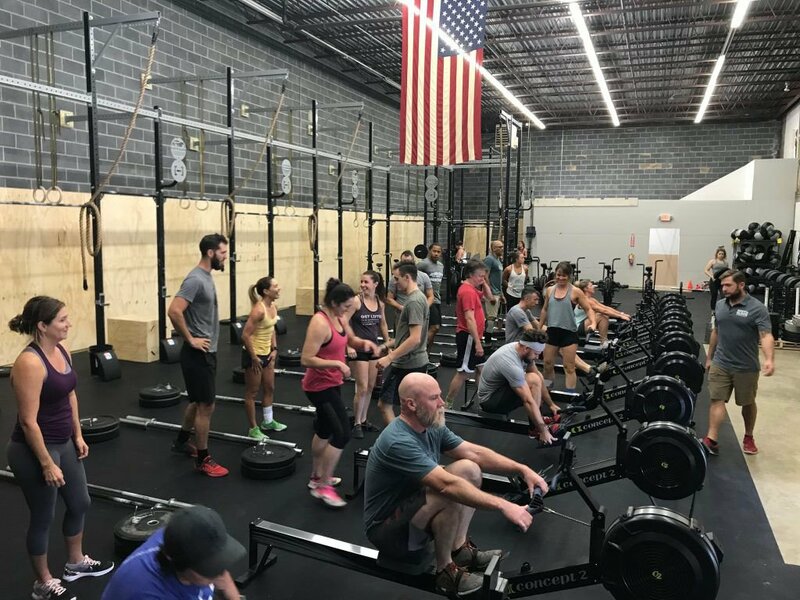 South Slope CrossFit offers an In-Doc process to introduce newcomers to the culture and community of the fitness program. Workouts can include numerous high skill movements that people may not be familiar with. And a mission of In-Doc is to introduce people to these movements based on their current ability level. Mirkin and Hartley bring their individual experiences and skills to their CrossFit gym. A former firefighter, Mirkin said that he got the Crossfit “bug” while working in that profession and doing necessary fitness training. “CrossFit is a great tool for firefighters and police officers to get in shape,” he says. “I grew up out-of-shape and overweight,” Hartley says, speaking of his path to the fitness profession. After joining the Navy, Hartley realized the need to improve his level of fitness and starting training. He later became interested in coaching and encouraging others to become fit. South Slope Crossfit is at 217 Coxe Ave., downtown Asheville. For more information and hours of operation, visit the website at SouthSlopeCrossFit.com or call 828-335-0808.